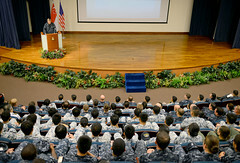 The two-week Singapore phase of exercise Cooperation Afloat Readiness and Training concluded Aug. 8. 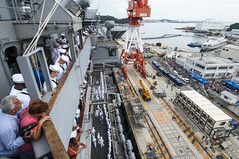 GWCSG ships and Sailors returned to Yokosuka, Japan, Aug. 8 after a three-month patrol in the U.S. 7th Fleet area of operations. 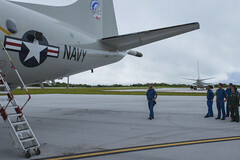 Military forces from Australia, New Zealand, Japan and the U.S. are partnering in a multinational anti-submarine warfare exercise Aug. 9-15 in waters around Guam. 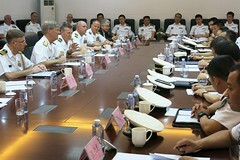 More than 50 senior officers from U.S. 7th Fleet and the People's Liberation Army Navy North Sea Fleet met Aug. 6 in Quingdao to discuss increasing cooperation, future exercise opportunities and improved communication between the fleets. 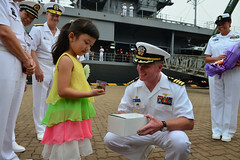 The U.S. 7th Fleet flagship arrived in Qingdao, China, Aug. 5 to promote maritime cooperation and reinforce a positive navy-to-navy relationship with the People's Liberation Army Navy (PLA(N)) North Sea Fleet. The U.S. and its Asia-Pacific regional partners are hosting exercise Fortune Guard 2014, Aug. 4-7 in Honolulu. 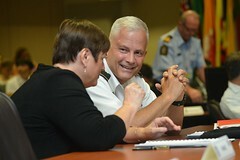 Rim of the Pacifc, the world’s largest international maritime exercise, concludes Aug. 1 after demonstrating the flexibility of maritime forces to meet regional and global challenges. 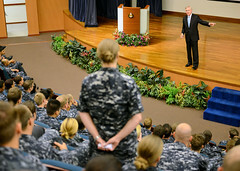 Secretary of the Navy Ray Mabus spoke to Sailors taking part in the annual Cooperation Afloat Readiness and Training exercise with the Republic of Singapore Navy, July 30. 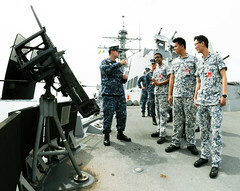 The 20th annual exercise Cooperation Afloat Readiness and Training (CARAT) Singapore commenced with an opening ceremony at Changi Naval Base, July 29. 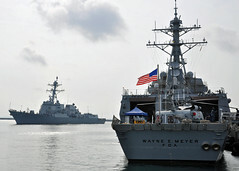 USS Halsey (DDG 97) joined USS Wayne E. Meyer (DDG 108) in Singapore July 28 ahead of exercise Cooperation Afloat Readiness and Training with the Republic of Singapore Navy.